Each time you or your opponent activates 1 Spell Card, put 1 Spell Counter on this card. Increase the ATK of this card by 500 points for each Spell Counter on this card. At the end of the Battle Phase of the turn this card battles, remove all Spell Counters from this card. Flip: Return a Magic card from your graveyard to your hand. Each time you or your opponent activates 1 Spell Card, put 1 Spell counter on this card (max.3). Remove 3 spell counters from this card to draw 1 card from your Deck. This card can only be Special Summoned by removing 1 LIGHT and 1 DARK monster in your Graveyard from play. Once during each of your turns, you can remove 1 face-up monster on the field from play. If you activate this effect, this card cannot attack during this turn. During your Standby Phase, increase your Life Points by 400 points for each monster on your side of the field. Each time you or your opponent activates 1 Spell Card, put 1 Spell Counter on this card. Remove any number of Spell Counters to destroy 1 face-up monster on the field with an ATK equal to or less than 700 points x the number of removed Spell Counters. During your Standby Phase, inflict 300 points of damage to your opponent's Life Points for each monster on your opponent's side of the field. While this card is face-up on the field, inflict 400 points of damage to your opponent’s Life Points each time you activate 1 Normal Spell Card. You can only activate this card while there is a Spellcaster-Type monster(s) on your side of the field. Inflict 200 points of damage to your opponent's Life Points for each Spellcaster-Type monster on your side of the field. If this card is in the Graveyard, you can add this card to your hand instead of conducting your normal draw during your Draw Phase. For every Magic and Trap Card on your side of the field, increase the ATK and DEF of the equipped monster by 500 points. Destroys all Magic and Trap Cards on the Field. You can only activate this card when there is a face-up "Dark Magician" on your side of the field. Destroy all Spell and Trap cards on your opponent's side of the Field. Each time a Spell Card is activated, increase the Life Points of this card's controller by 500 points. Discard 1 card from your hand. Destroy all face-up omnsters on your opponent's side of the field. 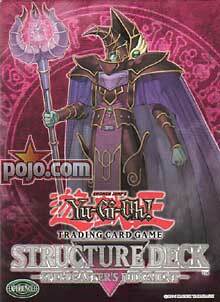 You can only activate this card while there is a face-up Spellcaster-Type monster(s) ou your side of the field. Tribute 1 monster on your side of the field and Special Summon 1 Spellcaster-Type monster from your hand. Then you can destroy 1 monster on the field. Select 1 monster on each side of the field. Destroy the selected opponent's monster and shift control of your selected monster to your opponent. This card remains face-up on the field for 2 of your opponent's turns. No monster can attack. Destroy this card during your opponent's 2nd End Phase after this card was activated. Negate the attack of 1 of your opponent's monsters and inflict damage equal to the attacking monster's ATK to you opponent's Life Points.